Yes indeed to all of that, Freddy. 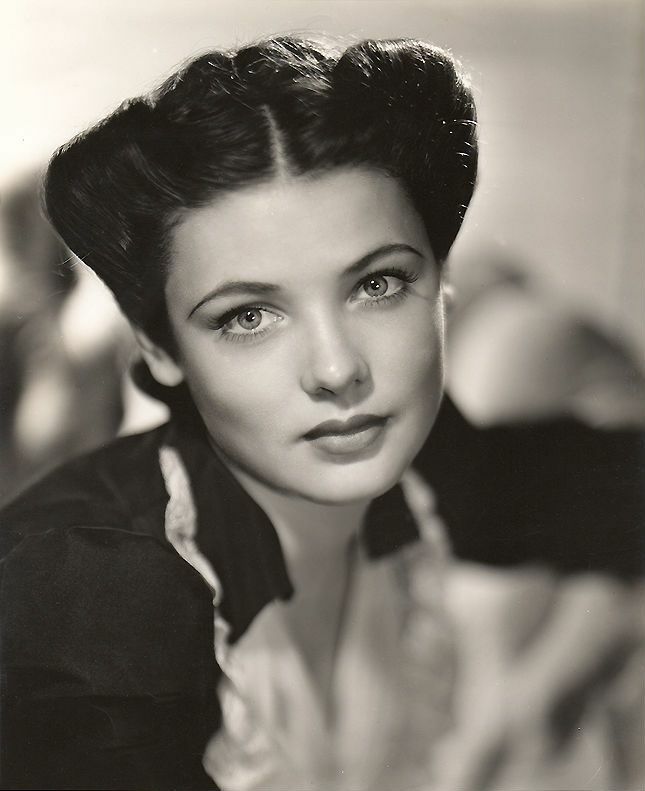 And I could add a few others: Gene Tierney; Grace Kelly; Liz Taylor (when young - as in Ivanhoe). There just seems to be something special about these 40s/50s stars; certainly they looked glamorous and dressed accordingly. These pictures contain -exactly- the sort of drama I love and try to emulate. 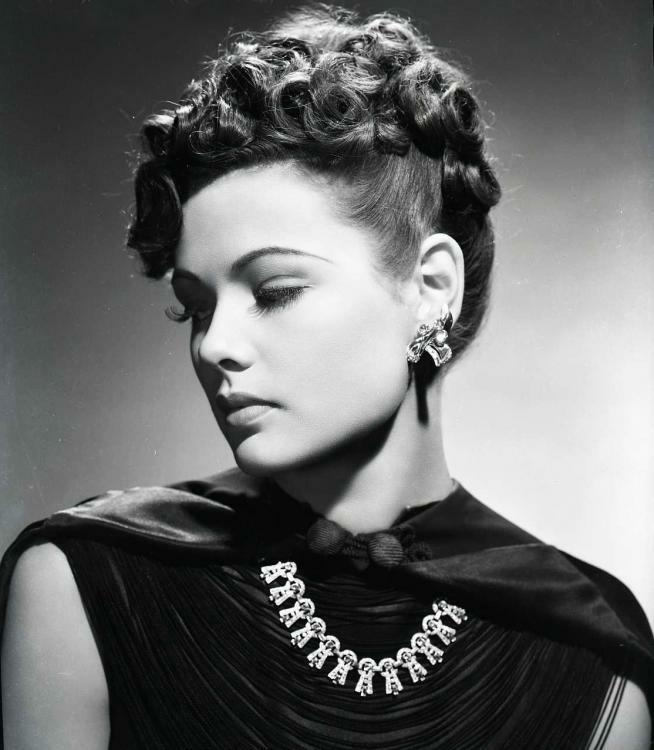 They certainly projected a kind of classy sophistication that is very rarely encountered on screen today. The whole era was really quite classy. My mother was a fairly successful fashion model during that era and never lost her dress sense. I can still recall the outfits she wore in the early 60s when I was a child and how she would always dress elegantly for travelling. Wouldn't dream if boarding a plane without looking fashionable and sophisticated. i look around the business lounge now and sigh. Times have sure changed. No, the original quote came from the John Huston directed 1948 film Treasure of the Sierra Madre. Based on a novel by the mysterious B. Traven. It is a famous line and has been quoted in numerous movies since. Well, the rules is ..... Name a filum, show a quote .... they have to be from the same film, not from a book! The quote is from the film. Nope. Click on the first 'clicky' on the post. The ACTUAL film clip is shown. That phrase isn't used. Word for word from the filum. We ain't got no badges. We don't need no badges. Play it again, Shyheels! Elementary, my dear Freddy! I will be happy to act as referee if the pair of are going to have a shoot-out to settle things! I don't think there needs to be a shoot-out. The video of the scene is there, as with accurate scripted lines from the scene. As well as doing intellectually clever work, in my past I've also done a reasonable amount of 'low grade' menial/manual work. One of those jobs some 30 years ago, was working as a cleaner in a large blue-chip company. (A back door route, to bigger and better things.) While working with skilled men in a production environment, I used to hear that "Badges" phrase several times every working day for around 3 months, until I got moved off the shop floor and into the offices to do the job I was really after. Tumblr zapped the link in one of the posts above, and as I dislike dead links ... it's revealed again here, but no link this time. Except Marks, where I found a size 12 Regular (length leg) in the shiny leggings, but with a longer leg than the 14R next to it. Not been home long, so not compared it to the 14R I already have. No apparent snapping of threads felt while stretching the waist either. Better still, now £12-50 from £25. I did find a pair of the River Island faux leggings I had tried previously, and in the right size, now down to £17. They stayed in the store, as I'm never going to make the time to put a button and loop across the waistband to prevent the zipper undoing. China, 2-3 weeks weeks, America 5-7 days, UK 1-5 days. Ordered from where? Tried the two newer pairs from Marks today. 14R's were stiff and short, with not much stretch in the leg. Weird. 12R's were reassuringly tight everywhere. Bit too tight around my Christmas (chocolate filled) tum. Mrs Freddy swore at me yesterday when I told her how much I'd munched through in two days. (Not very ladylike, was it? ) Anyway, the size 12 leggings are keepers. Unfortunately on two counts, Mrs Freddy saw the label on the leggings. 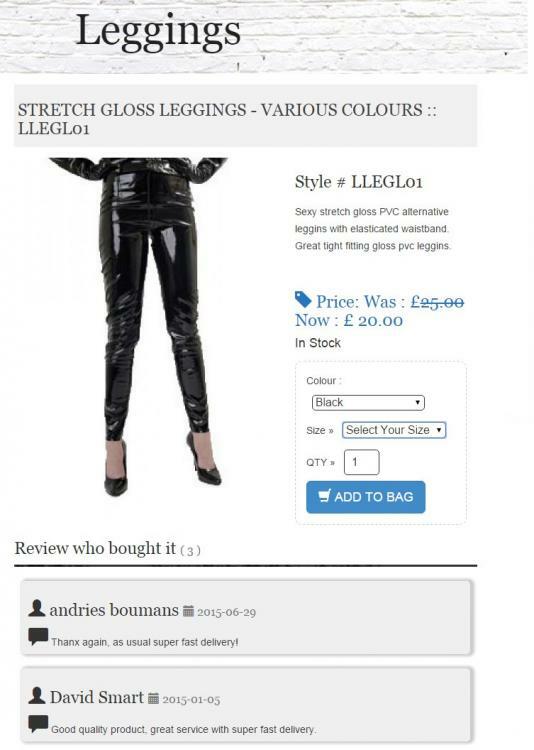 Firstly, it meant she knew the leggings were from Marks and they are not mean with their sizing. It also meant she knew that if they fitted, she had grown. Obviously, they were "too big" even if they weren't. They had felt small on me as they seemed to be made of a not-so-stretchy material to start with. On a woman with hips (I have none) well .... Too big? "I need a 12". And I had a pair, though not an expendable pair. I have to say, the 12's fitted much better than the 14's, and were even a tad loose on her waist, so very flattering in the numbers/sizing game. "So they going to be 'ours' then?" Was a question asked by my wife as she paraded around the bedroom in them. Looking at her lower half encased in a black shiny material did put a sparkle in my eye, so I replied; "Maybe." Which I think was rather gallant of me. I have found it never pays dividends to appear eager about anything, especially around womenfolk. Sounds like a very happy end to your search/project! Hollywood could not have scripted it better. I ordered my PVC skinny jeans from an ebay seller in the UK. Supposedly posted on the 15th, not here as of the 29th. Not sanguine on the prospect of their ever arriving. Not when orders places for other things, on Boxing Day, were arriving yesterday. I guess the whole PVC thing just wasn't to be. Not the sort of happy ending that is often used as a euphemism these days. With her up a 4.30am and minutes away from sleep that would carry her until 5am today. I'd managed to catch her practically undressed so the leggings 'try-on' caused minimum disruption. Again, sounds like pleasant sailing at your end of the bay. from >> here << as an example. They were the first and only supplier I looked at, though Google found others. This outlet also had other types without the rings, and at lower prices too. This was used as an example, not a recommendation. "Steampunk" would be another search keyword to use too, in lieu of goth. Germany is probably awash with PVC gear, as despite Brit's being thought of as the perv's of the world, I think Germans are way out in front of us. Thinking about it, Camden Market -which of course includes more shops than stalls- would be a good place to look for PVC trousers, if ever you find yourself 'in town'. The shops are open every day, with the additional stalls only being there at the weekend. These: from >> here << (same retailer). I kind of liked the uber slinky rock chic jeans my wife had in the 90s and these were they - first I'd ever seen. Your suggestion about Camden sounds like a good one- funnily enough I think that us where my wife found hers! I'm not at all Goth any more than I am fetish. 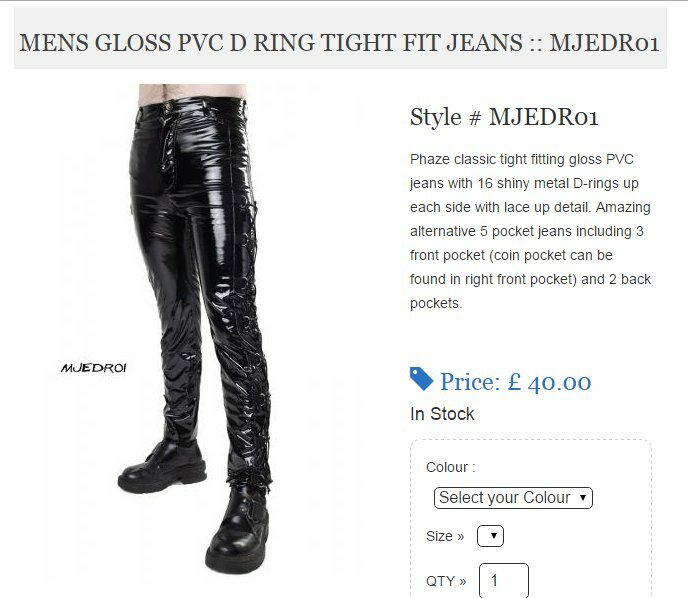 I just happened to like the look of this particular style of slinky PVC jeans and wanted to affect this bit of daring for myself. Camden isn't what it used to be - which was the place to shop for Goth or Punk followers. It's MUCH more commercialised than it used to be. I think the smarter business owners have bought out the less smart business owners. If you go in one punk shop, you've seen inside them all. There is much less variety (much less independence) than there used to be, 20 years ago. It's why I suggested a visit if you were there already, rather than making a special trip. I used to see all manner of quirkiness there, no longer, sadly. I've even witnessed a guy selling 'ganja' cake, not only in front of a policemen, but it being offered to him too. (He declined.) All done in good humour, but it shocked me a little too. It is sad, this loss of colour and quirkiness in the world. Good business people are seldom the quirky innovators, artists and stylists - and vice versa. It is like this in virtually every sphere, not just fashion. Quirkiness is bought out, its essence bowdlerised and the resulting bland form - a broad and common mediocrity - is marketed to the masses. You see it on high streets and market shelves everywhere.